The Virat Kohli-led Indian team created history after winning their first-ever Test series in Australia on Monday. 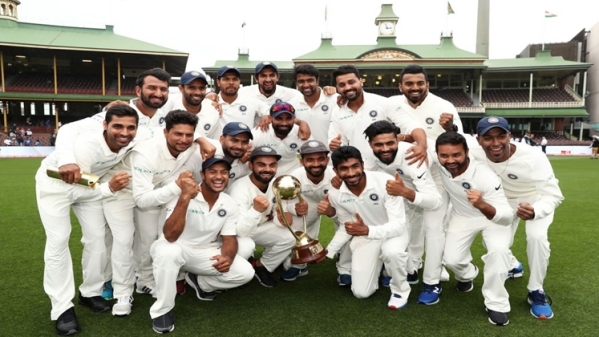 After the visiting team won the Adelaide and Melbourne Test of the series, the fifth and final Test at the Sydney Cricket Ground (SCG) here ended in a draw as no play was possible on the last day due to continuous downpour and India clinched the series 2-1. Opting to bat in the final Test, India took a commanding position as Cheteswar Pujara and stumper Rishabh Pant's scintillating 193 and 159-run respective knock guided India to a massive 622/7 in their first innings. Australia were six for no loss in their second innings and play wasn't possible on the final day of the Test, and due to continuous rains the contest ended in draw. Earlier, wet conditions had forced an early finish on day three and allowed less than two hours play on day four, before completely washing out the final day on Monday. Pujara was one of the main reason behind India's historic series win as the Saurashtra batsman accumulated 328 runs from three games, averaging 54.67. Pujara also slammed three tons in the crucial Border-Gavaskar series. Kohli also effectively supported with 259 runs from three games. In the bowling department, pacer Jasprit Bumrah turned out to be the most effective bowler for the visitors after bagging 21 wickets from four games while his partner Mohammed Shami also scalped 16 wickets.